It is with no small degree of sadness that I must announce the passing of a valiant and steadfast lens. 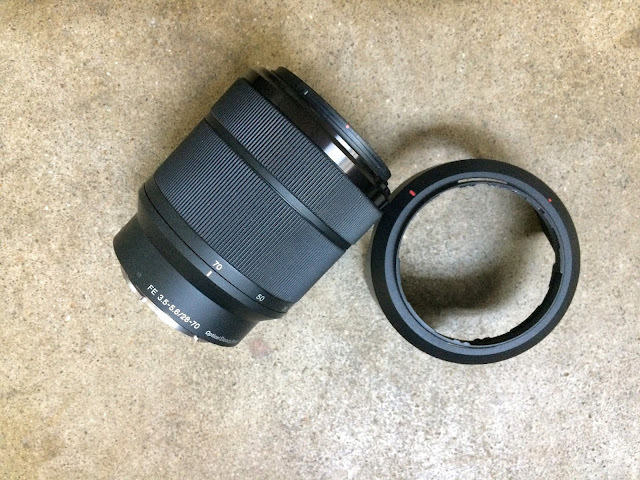 While the Sony FE 28-70mm lens was relatively new to the lens cabinet he was a jovial addition and quickly made friends with a diverse group of lenses from several different systems. He'll be remembered for his convenient size and weight as well as his ready wit. Often, he would muse to no one in particular, "Who needs anything wider than twenty-eight. Really?!" We lost him around 11:30 am, CST, today when he seemed to leap in front of a Sony A7Rii camera and the new 85mm lens in order to save them from an accidental tail wag. The assorted gear was sitting on a shelf about four feet from a (dreaded and obviously dangerous) Saltillo tile floor. The CEO of VSL had lifted his companion, Studio Dog, up off the floor in order to carry her across the way to the studio. One swish of a tail was all it took. The brave little lens was swept from the countertop with a fair amount of force and hit the floor with gusto, bouncing at least twice. Its companions came to no harm because of his brave intercession. At first there was hope that 28/70 had survived. There was no "apparent" damage. But a cursory check with the lens on a camera indicated that it had lost the ability to focus and had partially lost the ability to zoom. A eulogy will be said by his close friend, Sony 24-70mm f4.0 in a small, private ceremony. The wake begins after supper this evening. To say I am devastated may be slightly overstating the situation but I will state for the record that this is the last time I'll put loyal and valuable camera gear on the counter next to the front door again. If we can save one other camera or lens from the same tragedy our caution will have been worth it. We have maintained a safe space for lenses for over 20 years without incident. That sign (which brags of our safety record) gets replaced on Monday and, hopefully, will read = "No lens accidents in over 2 days".